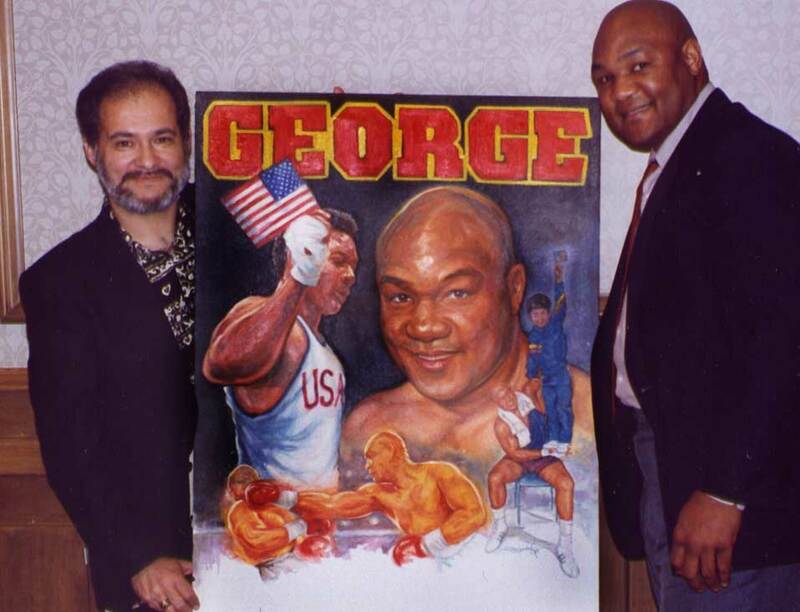 In 1994, Delgado was commissioned to create this work as a tribute to one of boxings greatest legends and most beloved personality in sports, George Foreman. 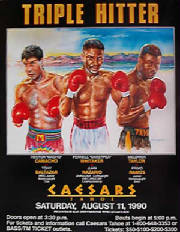 The subject matter for the art was first personally discussed and selected between the artist and the champ. George selected the scene where he won the gold medal at the 1968 Summer Olympics held in Mexico City, one of his proudest moments. This was especially special to him as he waved the U.S.flag in a time that was controversial. In another scene he wanted a generic figure being knock-out by those massive hands of his. "He wanted a unreconizable figure because he himself wouldn't want to be immortalized on a painting being punched out," says Delgado. In addition to his portrait there is a scene where he is lifting a young child with one hand. This symbolizes all of his wonderful charitable work he has and continues to work for especially his Houston Foundation. One special note: the boy shown is of the artist son, Armand. This work has appeared on several items and merchandise related to George's image. It has appeared along with him on television, press conferences and many other public events. Foreman was young, lean and angry when he beat Joe Frazier for the world heavyweight boxing championship in 1973. The next year he lost the title to Muhammad Ali in the so-called "Rumble in the Jungle" in Zaire. 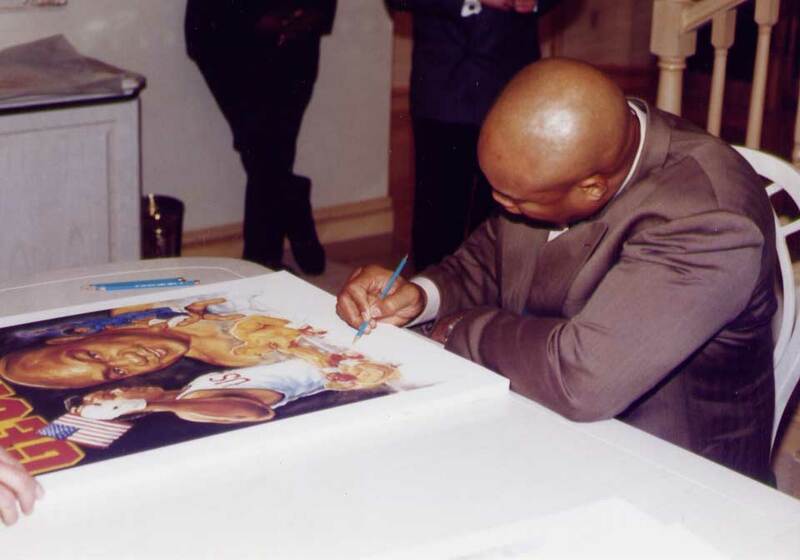 In the 1990s he returned to the public eye as a rotund, jovial fighter who somehow beat Michael Moorer in 1994 to regain the heavyweight crown. His subsequent self-mocking commercials for hamburgers and mufflers made him even more famous. Extra credit: Foreman was the Olympic heavyweight boxing champion in 1968... It's true: Foreman has five daughters and five sons and has named all of the sons George: George Jr., George III, George IV, George V, and George VI. 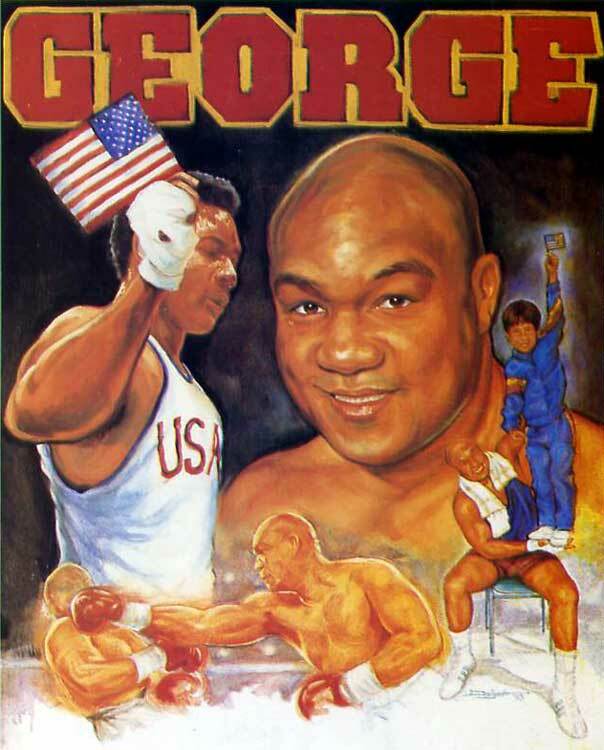 The official art of the Boxing Hall of Famer, the one and only George Foreman. One of boxing's most legendary feared and best loved boxers of all time. Each lithograph contains an actual AUTOGRAPH by GEORGE! Original is Available and Autographed contact artist.